Oh Three Oh Four: Lots of Lynnderella Swatches! All Most Love is a multiglitter featuring assorted bright matte and satin glitters in a clear base with aqua and pink shimmer. Here is 2 coats of All Most Love over 2 coats of Tweets AML. Bashful Buttercup contains perwinkle hexagons accented with coral and yellow glitters, as well as a few shy buttercups and micro-glitter in a clear multishimmer base. All nails are 3 coats of Bashful Buttercup with top coat. Bibbity Bobbity Boo Blue contains glitter in all shades of blue: turquoise, navy, royal, periwinkle along with blue-violet and violet in a cornflower blue base. The Bunny Code is a glittering green nail polish speckled with bits of red, purple, orange, silver and gold. These photos are 1 coat of The Bunny Code over 3 coats of Bibbity Bobbity Blue Boo with an accent nail of Bibbity Bobbity Boo Blue of 3 coats. Leading Man In s a new multiglitter with strong lavender-toned multishimmer in a clear base. These photos I started with 2 coats of Wet n Wild Fergie Glowstick and added 1 coat of Leading Man. Love, Lace and Lilacs has various sized opaque white hexes and translucent white hexes, as well as opaque white bar glitter with a fine silver shimmer in a clear base. Shown is 2 coats over 2 coats of L.A. Girl Sparkle Ruby. Mad Mint is a scattered glitter made with assorted pastels in a mint-shimmered translucent mint-blue base. All nails are 1 coat over 3 coats of China Glaze That's Shore Bright. Mercury's Rainbow has gunmetal holographic hex glitter and silver holographic micro glitter in a shimmering charcoal base. In these photos I used 1 coat over 2 coats of Zoya Claudine. Torrid as Her Glance... contains assorted satin teals contrasted with neon red, purple and green glitters in a clear microglittered base. All nails are 1 coat over 2 coats of Zoya Sailor. ...Unicorn Buys Next Round... contains a rainbow of assorted translucent neons with opaque white shapes in a multi-shimmered clear base. Here is 1 coat over 2 coats of Nails Inc. Baker Street. 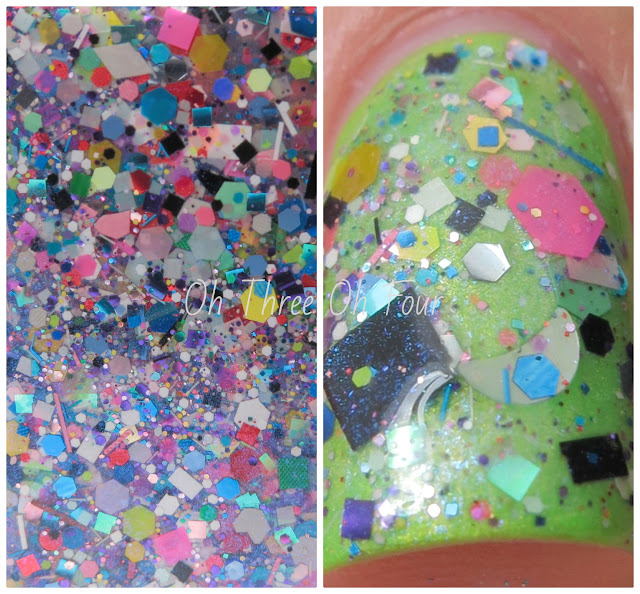 In this week's Polish of the Week giveaway you can win this polish, so make sure to enter! Purchase Lynnderella Lacquers through Lynnderella.com. If you are international you can purchase them through Norway Nails or Glitter Connect. Any smaller bottles featured in this post are decants friends gifted to me and Lynnderella does not sell minis, sorry! Make sure to follow the Lynnderella fan pages on Facebook, Twitter, Instagram, Pinterest and Tumblr.